Western blot analysis of extracts from Hela cells at a 1:2000 dilution using the Histone H4R3me1 (H4R3 Monomethyl) Polyclonal Antibody. 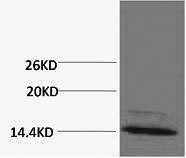 Western blot analysis of extracts of HeLa cell line and H4 protein expressed in E.coli., using Histone H4R3 Dimethyl Asymmetric (H4R3me2a) Polyclonal Antibody. Western blot analysis of extracts of HeLa cell line and H4 protein expressed in E.coli., using Histone H4R3 Dimethyl Symmetric (H4R3me2s) Polyclonal Antibody. Modulation of chromatin structure via histone modification plays an important role in the regulation of transcription in eukaryotes. Euchromatin, or loosely packed chromatin, is associated with gene expression, whereas tightly coiled chromatin, or heterochromatin, is associated with gene silencing. Varies. Please see user guide for recommended storage conditions for each antibody.